Stay on top of the new CMS regulations while you SAVE 15% on the 2012 edition NFPA 99 and Handbook Set! Order now and NFPA®'s Medical Gas Cylinder Storage White Paper is YOURS FREE! Recently adopted by the U.S. Centers for Medicare & Medicaid Services (CMS), the 2012 edition of NFPA 99: Health Care Facilities Code introduces a groundbreaking shift to a risk- vs. occupancy-based approach. 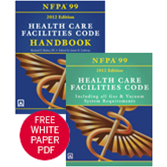 To help you comply, the answer-packed NFPA 99 Handbook explains the intent behind requirements, so you can prepare for state and CMS surveys and do your best to protect patients, staff, equipment, and facilities. SAVE 15% and be ready to help meet the new CMS Conditions of Participation (COP) with the NFPA 99 Set -- including a FREE White Paper clarifying how today's NFPA 99 addresses the storage and handling of medical gas cylinders. Anyone whose job involves health care facility safety and CMS compliance needs this must-have Set!